"The whole Smithsonian was like one big family . . . "
"Just ask Miss Weiss," was a familiar refrain for many years at the mid-twentieth century Smithsonian. 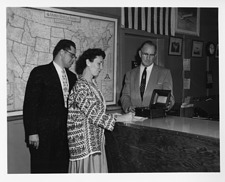 Ever organized and efficient, Miss Weiss handled all of the correspondence for the United States National Museum, served as registrar who processed all new acquisitions, oversaw the mail room and shipping, facilitated customs and passports for travel and international shipping, and even served as a "nurse" at the first aid station! One of the first women managers at the Smithsonian, Miss Weiss was devoted to the organization that she described as "one big family." When she arrived in 1931, the Smithsonian was small, with the treasurer handing out pay to each employee individually. By the time she retired in 1971, it was a much larger organization, spanning the globe. Born in Shipman, Illinois, in 1906, Helena M. Weiss attended business college and trained as a secretary. In 1929, her employer in Pennsylvania advised her to seek a government job to gain security during the Great Depression. He sent her to Washington, DC, to the care of his cousin, and the intrepid young woman headed to the nation’s capital, only to find the cousin had left for Canada. On her own, she moved into the home for elderly women where the cousin lived, and cried herself to sleep for the first week. But she soon found a job at the Veterans’ Administration (VA), a congenial roommate of her own age and a lovely apartment. The work at the VA stenography pool was rather boring. When she heard of a job at the Smithsonian, she pursued the opportunity, even though she knew little about the Institution. On May 22, 1931, Miss Weiss was appointed a CAF-2-6, Junior Clerk-Stenographer in the Division of Correspondence and Documents. 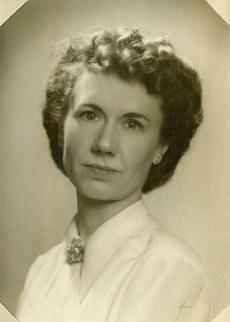 She worked for several different departments, including Anthropology and Geology. But most of her career was spent in the Division of Correspondence and Documents, directed by the kindly Herbert S. Bryant. During those years, correspondence to and from the Smithsonian went through a central office, with two stenographers typing hundreds of letters every month. Eventually Miss Weiss succeeded Bryant - becoming one of the first women managers at the Smithsonian. She loved the diversity of her work, being fascinated by the scientific research and the unique objects acquired by the National Museum. In December of 1948, as she took over as director, to her amazement the Wright Flyer went on display to one of the largest crowds the Museum had ever seen. She anxiously awaited the arrival of the Hope Diamond being delivered by the US Postal Service through the regular mail, and she marveled at the size of the Fénykövi elephant in the Natural History Museum rotunda, despite the fragrance of the enormous hide when it first arrived. 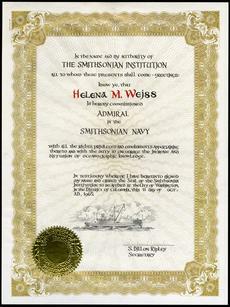 Some of Weiss' other duties included the planning of field trips for curators to archeological sites in Iraq, geological sites in Canada, remote islands in the South Pacific, the Smithsonian’s new field station in Panama, and, most memorably, to the site of Parícutin, a new volcano in Mexico. The Parícutin volcano so fascinated her that she visited the region herself to see this rare phenonmenon. For all of these trips, Miss Weiss would arrange passports and visas, ship collecting supplies overseas, and ensure that precious specimens made it safely back to the National Museum. 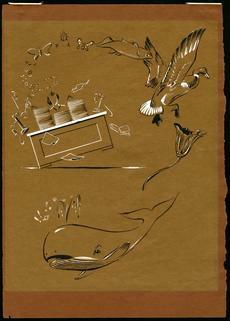 Several curators captured her contributions in a hand-drawn birthday card. Miss Weiss' work often put her at the center of scientific discussions. In her Oral History interviews, she recalled feeling like she was part of a science fiction novel as she took notes at meetings with astrophysicists in the 1950s and early 1960s as they planned exploration of space and talked of a man on the moon. These discussions seemed simply incredible to her, but she knew the scientists were quite serious. And to her amazement, she lived to see it all come to pass. For Miss Weiss herself, any amount of work could and would be done for the Institution she loved. Secretary S. Dillon Ripley, as a performance award, appointed her an "admiral in the Smithsonian Navy." 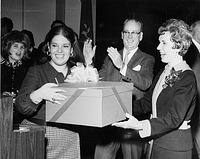 Indeed, when she retired in 1971, her workload was distributed to several different employees. But as she said herself, "people never give up at the Smithsonian."